Technological development, nowadays, has entered a crucial stage that gives precedence to the innovative obsolescence over the physical one. To that effect, of utmost importance, therefore, is the accurate identification of the extent, i.e. the degree of innovative obsolescence in an effort to assess the effect of innovation upon the technical-economic performance and social outcomes of the industrial activity. Moreover, in an increasingly globalizing economy, innovations are bound to make a worldwide impact, accelerating the innovative technological obsolescence with the level of technology being utilised is globally lagging further behind the level of today’s technology. Prolonged use of obsolete technology and outdated technological processes leads to certain losses, the amount of which is contingent on the extent of the lag range. Advanced in the paper is an alternative approach to determining innovative obsolescence of technological products and the respective solutions in pursuit of a marked reduction in its adverse effects. The realization of technological transfer and forming of innovative potential of the enterprises is of great significance for their development and progress in the dynamic modern business environment. The purpose of the present article is to show some possibilities and restrictions related to the realization of the technological transfer, forming and development of the innovative potential of the enterprises in Bulgaria. Some basic trends are emphasized related to the realization of the technological transfer, forming and development of the innovative potential of the enterprises in Bulgaria. Given that the topic of the invention of new technologies for the usage of alternative energy sources is following an ascending rate of constant innovative solutions, the problem with the detection of all iconomical and ecological side effects also needs to be brought to attention. Similar is the problem with the usage of renewable energy sources based on domestic waste which is also developing in that direction. This is why the initensive factors for the progress of this process are changing their dimensions and are going to be closely related with both the effective usage and improvement of the technologies, and the raising of the overall efficiency, taking into account the benefits of solving social, ecological, household and other problems. Also similar is the problem with the domestic waste used as raw material for renewable energy sources. The subject of observation of this present article is the development of this process based on innovation and the raising of its efficiency, also taking into account the side effects related to the ecology, solid and domestic waste. Measurement indicators for these effects with unified dimentional unit (leva) are suggested and an approach for measurement of their manifestation is formulated. Innovation is a key component of the development of the economy, the competitiveness of national economies and the high quality of long-term performance. To acquire and maintain competitiveness is strongly dependent today on innovation. For many years innovation related studies concentrated on technological innovation. Although Schumpeter has defined innovation in a broader sence, including market and organizational innovations as well, studies mainly have left out of consideration the economic, managerial and social elements of innovation. During the last 15 to 20 years social innovation has emerged as a major area of studies in innovation. How do all the actors of the economy see it? How does one help each other? We seek answers to these questions in a research on innovation and social innovation in a wider area, from which the present study focuses on social attitudes in technical and social innovation. 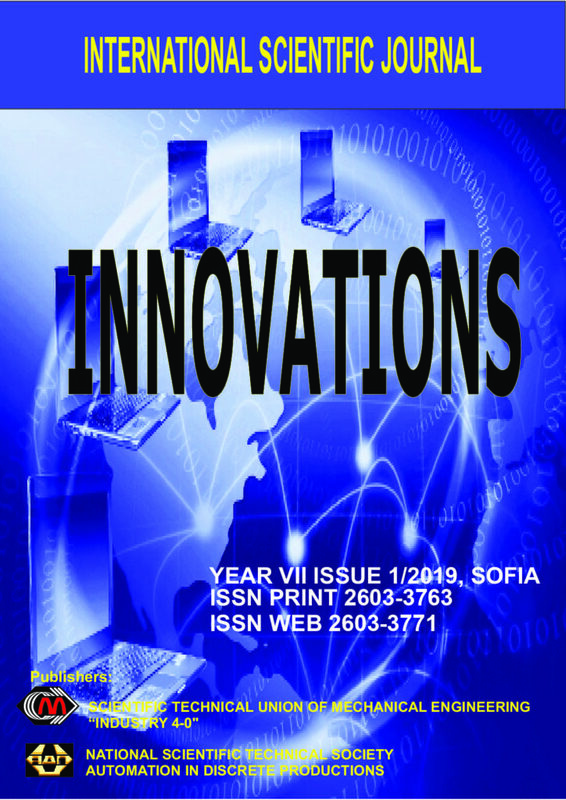 This paper examines the current organizational structures of business in Bulgaria – industrial zones, technology parks, business incubators and clusters with their products, which are based on innovative projects. Made a description of the design analysis of investment projects. The descriptions follow a common structure to facilitate the work of the user, but also to promote the standardization of procedures for analysis and reporting and to facilitate communication between those who propose projects for evaluation and their evaluators. Attached are the results of experimental verification and are statistically lip service given in graphical form. Industrial development has brought about qualitative changes in the very foundation of innovation and automation. The distinctive features of enterprises with such a type of production are becoming increasingly blurred by the growing tendency for global industrial development. They become heavily dependent on the pace of development of automation, industrial technologies, communications and ever more determined by the factors that most affect and shape the trends of that development. It is therefore of utmost importance to carefully define the distinctive features of modern logistics processes that form the foundation of the respective digital development policies, which is also the primary objective of the proposed paper. These policies are undoubtedly enforced by the very evolution of technology and are likely to define the new directions of cyber development. Upon commissioning – tangible and intangible fixed assets are recorded in the inventory inventories, which includes the cost of transport and bringing the assets to normal operation in an operating environment (including installation, test, calibration, etc.). This process is strictly regulated, both normative and factual. After the asset is released, its amortization or accrual of depreciation charges begins. During the depreciation period, wastage is recorded, but no account is taken of innovation aging. This reporting has the side effects of rapid technical developments in communications and information technology. This article attempts to provide a methodological explanation for this manifestation and to find an approach for determining the magnitude of scattering or value-estimation of the dynamic asset environment. The dynamics of the environment in which businesses operate underlines the need for new tools and approaches to management engineering. There has been recently a growing interest in finding comprehensive solutions covering all aspects of the entire business management. Besides, with a more pronounced customer-centred focus of the company, the competition now takes on a brand-new character considering the fact that the rivalry is not between individual companies, but between entire chains of manufacturers and suppliers. The research study focuses on the need for innovative engineering solutions in response to company’s management processes. A network approach has been proposed as an opportunity to implement the reengineering of external processes (Х-engineering). Moreover, such a proposition is strongly substantiated by the fact that modern companies are prone to expand their activities in the (cyber) space, working together in different types of business networks (Businessnetwork-BN). The article presents the design of Home Automation System (HAS) with low cost and wireless system. This system is intended to help and supply support so as to meet the requirements of older and disabled in home. Also, the good home conception within the system improves the quality living reception. The switch mode and voice mode square measure accustomed management the house appliances. The video feedback is received within the automaton application that streams the video of IP Camera. The main control system implements wireless technology to provide remote access from smart phone. The design remains the prevailing electrical switches and provides additional safety management on the switches with low voltage activating methodology. The switches standing is synchronized altogether the system whereby each computer program indicates the real time existing switches standing. The system meant to regulate electrical appliances and devices in house with comparatively low price style, user-friendly interface and ease of installation. A multistage filtration system has been conceptualized, designed, and prototyped. The system is suitable for various types of on-line liquid analyzers. The developed technology resulted to a low-cost, compact, flexible and reliable automatic system that is based on the use of common, low-cost filters combined with a novel, automatic filters replacement mechanism. A general overview of the device is provided and the design procedure that was followed is discussed. optimizing the concentration and size of the used nanoparticles, the rheological and filtration properties of the used drilling muds were improved.